Here is my usual round-up of the things Liam is loving right now! He is getting more interactive & hands on. We are go, go, go all the time, so I'm trying to slow him down a bit with more actual activities instead of just general playtime. 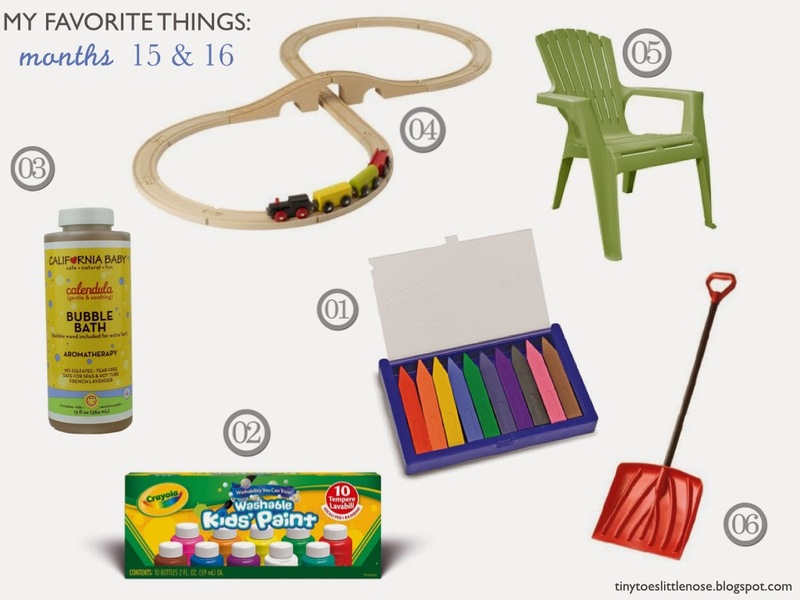 This list would also serve as a wonderful gift guide if any of you are shopping for a little guy or gal (these are all gender neutral) around Liam's age... 'Tis the Season! I love the Melissa & Doug Triangle crayons, they were so easy for my kids to handle, especially with their small hands. And that I didn't have to worry about ripping off any paper as they wore the crayons down was great. Those must be some of my favorite things as well, I think the only thing I don't have is the bubble bath. The bubble bath is 13 oz, so pretty big. It's very bubbly so you don't need to use much. Interesting... I think I need to buy abby some!